Republican 2016 Contenders Have Taken Positions on NSA Reform. Where Does Hillary Clinton Stand? If Hillary Clinton has a position on the government's domestic spying, she's doing a good job of hiding it. More than a year after Edward Snowden's leaks, the former secretary of State has yet to offer a meaningful assessment of the National Security Agency's mass-surveillance programs. She's had plenty of chances, but in interviews, speeches, and even her new book, Clinton has repeatedly ducked the issue with vagaries and clichés. The possible 2016 candidate rarely discusses NSA spying unprompted. And when she does, her remarks are often couched in opaque platitudes about the need to balance privacy and national security concerns. Last week, for example, Clinton heaped praise on Sen. Mark Udall for "leading the Senate in asking the hard questions about intelligence and the trade-off between liberty and security." Her remarks came during a campaign rally for the Colorado Democrat, who is locked in a fierce reelection battle with GOP challenger Rep. Cory Gardner. Udall has been among the Democrats leading a push for tighter reins on the NSA, but Clinton hasn't endorsed any of his proposals to pull back the agency. At times, she has appeared to fall on the other end of the spectrum. The push for surveillance reform largely stems from NSA secrets spilled by Snowden, the former agency contractor who now lives under asylum in Russia. Yet during his globe-trotting quest for asylum last summer, Clinton condemned Snowden's leaks as "outrageous behavior" and said that Hong Kong's decision to let him flee would "unquestionably [have] a negative impact on the U.S.-China relationship." 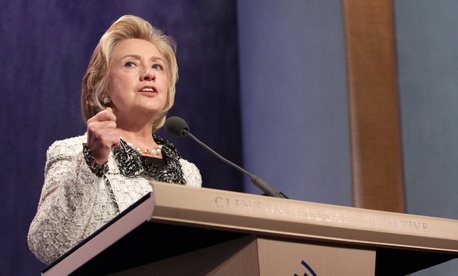 In April of this year, Clinton went further, suggesting Snowden's leaks helped terrorists. But Clinton has said that "some changes" must be made. In June, Fox News journalist Greta Van Susteren tried asking Clinton three consecutive times whether she thought warrantless spying on Americans violated the Constitution. Clinton largely demurred. "The Congress is trying to square Americans' constitutional right under the Fourth Amendment and the necessity for information that can be connected to terrorist activity here at home or abroad. It's a really difficult balancing act," Clinton said in the interview. "But you are 100 percent right, that we have to make some changes in order to secure that privacy, that constitutional right to privacy that Americans are due." And what changes are those? Clinton hasn't elaborated. Ready for Hillary, a pro-Clinton PAC, did not reply to a request for comment on Clinton's NSA views, and a pair of former Clinton advisers could not be reached. The best clues to Clinton's NSA views come from her Senate voting record, but her history reveals no clear pattern. Clinton voted in favor of the post-9/11 Patriot Act, which greatly expanded the intelligence community's surveillance authority and is the legal underpinning for the NSA's bulk collection of nearly all American phone records. But that was a vote taken at a time when a shell-shocked American public was much more sympathetic to surveillance than it is in 2014. Ninety-six other senators also voted for the Patriot Act, but a significant portion have since walked back their support for broad spying powers. The legislation's author in the House—Republican Rep. Jim Sensenbrenner of Wisconsin—is now crusading to pull back surveillance programs ushered in under the bill. Perhaps more instructive is when Clinton, just a month after dropping out of her protracted presidential primary battle with then-Sen. Barack Obama, joined 27 Democrats in voting against an amended version of the Foreign Intelligence Surveillance Act. The measure was fiercely opposed by civil-liberties groups, which assailed a controversial provision granting immunity to telecom companies that complied with President George W. Bush's warrantless-wiretapping program. It also secretly provided the authority for the NSA's PRISM program, which was exposed by Snowden and allows the government to collect Internet communications from U.S. companies, including Google and Facebook. Clinton's opposition was especially notable given that Obama voted for the bill, a decision that enraged many of his most ardent supporters. "Any surveillance program must contain safeguards to protect the rights of Americans against abuse, and to preserve clear lines of oversight and accountability over this administration," Clinton said in a statement at the time. "While this legislation does strengthen oversight of the administration's surveillance activities over previous drafts, in many respects, the oversight in the bill continues to come up short." Clinton's relative quiet on NSA reform stands in contrast to Republicans' 2016 field, whose likely members have taken public—and opposing—stands on the issue. Assuming that Sen. Rand Paul officially declares his intention to run for president, a central plank of his platform will be dismantling the government's mass-surveillance programs. The Kentucky Republican has been among the loudest critics of the NSA, going as far as to file a class-action lawsuit accusing the agency of violating the Fourth Amendment with its bulk collection of American phone records. And when Sen. Ted Cruz joins the 2016 fray, it's clear he also would campaign on reigning in the intelligence community's snooping. The tea-party Texan has attached his name to Senate legislation that would curtail several key parts of NSA spying. Marco Rubio? Florida's defense-hawk senator has flown a different course, cautioning that limits to the NSA could hamper our fight against the Islamic State of Iraq and Syria. New Jersey Gov. Chris Christie, meanwhile, has also defended government spying, instructing its critics to reevaulate their stance by sitting down with the families of victims lost in the Sept. 11, 2001, terrorist attacks. Clinton's relative quiet on the issue compared with Republicans likely stems from the fact that—unlike Paul, Rubio, Cruz, and Christie—she currently doesn't hold elected office, leaving her free from making any decisions on the issue. But if she does run for president, ducking the question will become near impossible. Sooner or later, Clinton will need to articulate a firm stance on government snooping if she wants to return to the White House, said Neema Guliani, legislative counsel with the American Civil Liberties Union. "Candidates are going to have to answer questions about specific programs, and they won't be able to hide from issues the way they could six, seven years ago," Guliani said. "People are going to keep asking. There is no hiding from this question." This article appears in the October 28, 2014 edition of NJ Daily.